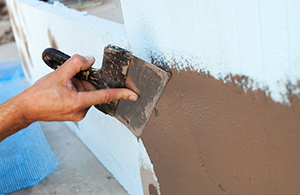 Having a stucco finish on your exterior walls does not prevent you from putting in a deck. All you have to do is install a ledger board, which is typically required in most deck installations. Here is a useful guide on how to do this. Mark the area: Use a chalk to mark the location of the ledger board. Ideally, it should be one inch below the bottom of your door. Cut the stucco: Determine how deep the stucco is by drilling a hole in it. Use a circular saw to cut along your chalk lines to a depth of 3/8 inch. You can then use a chisel to chip off stucco parts that have not fallen off. Seal the area: This will prevent water from getting behind the ledger board once it has been installed. Now it is time to install a piece of flashing which will hold the ledger board firmly and protect the exposed area. Installing the flashing: Make sure the flashing is firmly attached and bend it to form a perpendicular lip. Caulk it to seal the flashing in the stucco. Attach the ledger board: Drill holes in the flashing and fill them with caulking. Attach the ledger board with the help of lag screws which should typically go into a wall stud. When buying screws, select a material that is corrosion and weather resistant. You may now attach your deck to it. The staff at Platinum Stucco has experience working on a wide variety of residential and commercial projects. We can advise you on colour and texture selection, and how to keep your stucco looking beautiful for years. 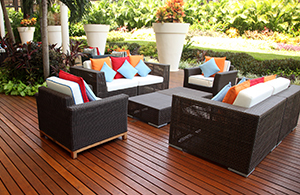 We will happy to give you tips on any additions or renovations you might want to make to your exteriors. To learn more about upgrading, renovating or making additions to your home, call Platinum Stucco 416-731-8600 or request an estimate online. You can also visit our store to see the products we offer and talk to our team.